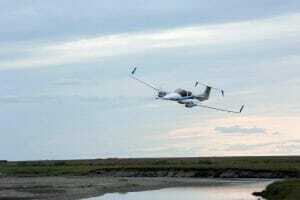 Anderson’s airborne eddy-covariance system flies over melting permafrost in Alaska. As the ice in the soil melts, greenhouse gases like nitrous oxide escape into the atmosphere. April 15, 2019 – About one fourth of the Northern Hemisphere is covered in permafrost. Now, these permanently frozen beds of soil, rock, and sediment are actually not so permanent: They’re thawing at an increasing rate. Human-induced climate change is warming these lands, melting the ice, and loosening the soil. This may sound like any benign Spring thaw, but the floundering permafrost can cause severe damage: Forests are falling; roads are collapsing; and, in an ironic twist, the warmer soil is releasing even more greenhouse gases, which could exacerbate the effects of climate change. From the first signs of thaw, scientists rushed to monitor emissions of the two most influential anthropogenic (human-generated) greenhouse gases (carbon dioxide and methane). But until recently, the threat of the third largest (nitrous oxide) has largely been ignored. In the Environmental Protection Agency’s (EPA) most recent report (from 2010), the agency rates these emissions as “negligible.” Perhaps because the gas is hard to measure, few studies counter this claim. Now, a recent paper shows that nitrous oxide emissions from thawing Alaskan permafrost are about twelve times higher than previously assumed. “Much smaller increases in nitrous oxide would entail the same kind of climate change that a large plume of CO2 would cause” says Jordan Wilkerson, first author and graduate student in the lab of James G. Anderson, the Philip S. Weld Professor of Atmospheric Chemistry at Harvard. Since nitrous oxide is about 300 times more potent than carbon dioxide, this revelation could mean that the Arctic—and our global climate—are in more danger than we thought. 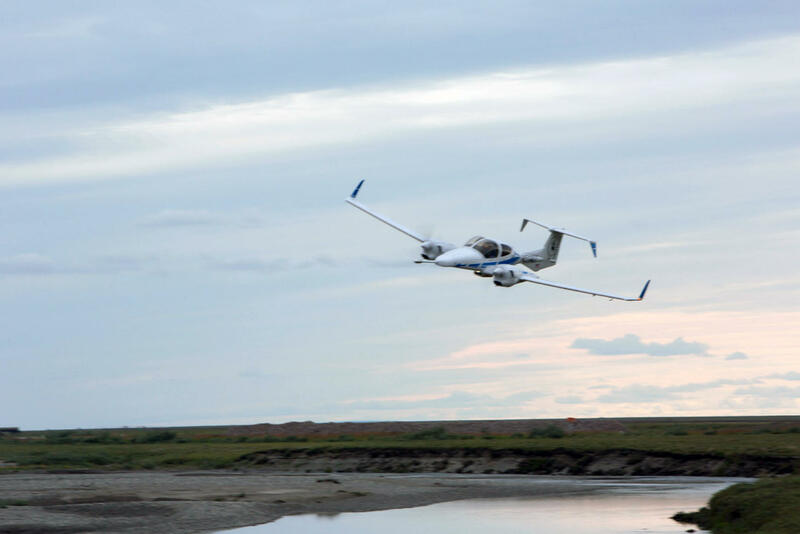 In August 2013, members of the Anderson lab (pre-Wilkerson) and scientists from the National Oceanic and Atmospheric Administration (NOAA) traveled to the North Slope of Alaska. They brought along a plane just big enough for one (small) pilot. Flying low, no higher than 50 meters above the ground, the plane collected data on four different greenhouse gases over about 310 square kilometers, an area 90 times larger than Central Park. Using the eddy-covariance technique—which measures vertical windspeed and the concentration of trace gases in the atmosphere—the team could determine whether more gas went up than down. In this case, what goes up, does not always come down: Greenhouse gases rise into the atmosphere where they trap heat and warm the planet. And, nitrous oxide poses a second, special threat: Up in the stratosphere, sunlight and oxygen team up to convert the gas into nitrogen oxides, which eat at the ozone. According to the EPA, atmospheric levels of the gas are rising, and the molecules can stay in the atmosphere for up to 114 years. In Alaska, Anderson’s field team focused on carbon dioxide, methane, and water vapor (a natural greenhouse gas). But, their little plane picked up nitrous oxide levels, too. When Wilkerson joined the lab in 2013, the nitrous oxide data was still raw, untouched. So, he asked if he could analyze the numbers as a side-project. Sure, Anderson said, go right ahead. Both of them expected the data to confirm what everyone already seemed to know: Nitrous oxide is not a credible threat from permafrost. Wilkerson ran the calculations. He checked his data. He sent it to Ronald Dobosy, the paper’s second author, an Atmospheric Scientist and eddy-covariance expert at the Oak Ridge Associated Universities (ORAU) at NOAA. After triple checks, Wilkerson had to admit: “This is widespread, pretty high emissions.” In just one month, the plane recorded enough nitrous oxide to fulfill the expected cap for an entire year. Still, the study only collected data on emissions during August. And, even though their plane covered more ground than any previous study, the data represents just 310 of the 14.5 million square kilometers in the Arctic, like using a Rhode Island-sized plot to represent the entire United States. Even so, a few recent studies corroborate Wilkerson’s findings. Other researchers have used chambers—covered, pie plate-sized containers planted into tundra—to monitor gas emissions over months and even years. Other studies extract cylindrical “cores” from the permafrost. Back in a lab, the researchers warm the cores inside a controlled environment and measure how much gas the peat releases. The more they heated the soil, the more nitrous oxide leaked out. Both chambers and cores cover even less ground (no more than 50 square meters) than Anderson’s airborne system. But together, all three point to the same conclusion: Permafrost is emitting far more nitrous oxide than previously expected. “It makes those findings quite a bit more serious,” Wilkerson says. Right now, eddy-covariance towers—the same technology the Anderson crew used in their plane—monitor both carbon dioxide and methane emissions across the Arctic. Anderson was the first to use airborne eddy-covariance to collect data on the region’s nitrous oxide levels. And, apart from the small-scale but significant chamber and core studies, no one is watching for the most potent greenhouse gas. Since the Arctic is warming at almost twice the rate of the rest of the planet, the permafrost is predicted to thaw at an ever-increasing rate. These warm temperatures could also bring more vegetation to the region. Since plants eat nitrogen, they could help decrease future nitrous oxide levels. But, to understand how plants might mitigate the risk, researchers need more data on the risk itself. In his place, Wilkerson hopes researchers hurry up and collect this data, whether by plane, tower, chamber, or core. Or better yet, all four. “This needs to be taken more seriously than it is right now,” he says. The permafrost may be stuck in a perpetual climate change cycle: As the planet warms, permafrost melts, warming the planet, melting the frost, and on and on. To figure out how to slow the cycle, we first need to know just how bad the situation is. This work was funded with a grant from the National Science Foundation. Next articleHow much compost is enough for my garden?